Pete talks about he went from being an award-winning chef from to a health advocate. Primal Body Primal Mind provided much of the inspiration for Pete and his wife Nicola Robinson to start to change that way they cooked and ate at home and this lead Pete to realise the value of whole foods, lower-carb approach to eating. 19:00 – Is the next step in health care mind-body integrative work? If you like these articles, check out my Patreon page, where you can donate as little as $1 per month to help support nutrition research and receive exclusive member-only benefits. Following the latest claims that Coconut Oil is ‘poison’ [https://www.nzherald.co.nz/lifestyle/news/article.cfm?c_id=6&objectid=12111528] I thought it was a good chance to update the article below. [https://theconversation.com/five-claims-about-coconut-oil-debunked-85320] that health claims surrounding Coconut Oil (CO) have been debunked. But have they really? And is CO a good addition to the diet…or is it a health-damaging fad? At least one study has shown a reduction in waist circumference. In a 12-week, randomised, double-blind clinical trial involving 40 women aged 20–40 years, participants were given a supplement of either 30 ml of coconut oil or soybean oil. Reductions in BMI were observed in both groups but only the group taking coconut oil reduced waist circumference.1 Waist circumference, as a proxy measure for abdominal adiposity, is a primary sign of insulin resistance and metabolic disorder. Health claims for coconut oil often rest on studies performed on MCTs. The claim made by Stanton and many others is that lauric acid (the C:12 fatty acid which makes up most of the coconut oil) does not act like an MCT and is digested in the same way as ‘normal’ dietary fats. In other words, like long-chain fatty acids (over 12 carbon chains in length) they will be bundled up with protein transporters and take up into the lymph and then deposited into the bloodstream as compared to MCTs which passively diffuse into the hepatic portal vein to be transported directly to the liver where cool stuff happens (like the creation of ketones!). While there IS limited of research demonstrating differences in the hepatic vs. lymphatic deposition of fatty acids of varying chain lengths it certainly appears that (with some exceptions) lymphatic deposition of fatty acids from triglycerides increases with carbon chain length.2 This has been demonstrated in rats by Mu and Hoy. In their study, recoveries from lymph of caprylic acid (8:0), capric acid (10:0), and lauric acid (12:0) were 7.3 +/- 0.9, 26.3 +/- 2.4, and 81.7 +/- 6.9%, respectively.3 That shows that little lauric acid is taken up into the liver for conversion to ketones But other research has shown conflicting results. For example, McDonald et al., have demonstrated that at low rates of infusion, 72% of lauric, 58% of myristic, 41% of palmitic, 28% of stearic, 58% of linoleic, and 68% of linolenic acid bypassed the lymphatic pathway.4 So, in that case, nearly ¾ of the lauric acid (12:0) was taken up by the liver. However as Bloom, and colleagues demonstrated as far back as 1951, deposition locations of lauric acid varies considerably between (animal) study subjects.5 and this is likely to be dependent on the position (sn-1, -2, or -3) of the fatty acid on the glycerol backbone and on individual factors of absorption. 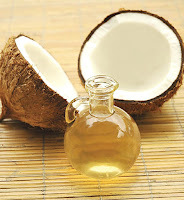 In our clinical research we have observed a direct effect of coconut oil on ketonaemia (the presence of ketones in the blood) and so we have a working hypothesis that in humans’ coconut oil, while not as ‘active’ as an MCT as the shorter chains (C:6-10) it does still exhibit similar activity. This is a hypothesis we will be testing in research commencing in 2018. While it isn’t transported to the liver in the same quantities as the ‘true’ MCTs and isn’t as ketogenic, lauric acid (from CO) is still ketogenic and offers some of the benefits of the C:6-10 fatty acids. A common claim, due to it consisting predominantly of saturated fats, is that CO is detrimental to heart health. Thankfully most people have ditched the saturated fat-heart disease hypothesis…AND there is direct evidence which suggests that CO is not detrimental to cardiac health or other health outcomes. In a comparison of Pacific peoples using differing amounts of CO, Prior and colleagues (1981) evaluated diets of atoll dwellers in Pukapuka and Tokelau in which coconut is the chief source of energy for both groups. Tokelauans exhibited higher saturated fat intake (63% of energy derived from coconut) than Pukapukans (34% energy derived from coconut) and had higher cholesterol levels. But despite this, cardiovascular diseases were uncommon in both groups, with no evidence that higher saturated fat intake, and higher coconut intake providing a harmful effect 6. Update: In recent studies, the heart-healthy properties of CO have been further demonstrated. Coconut oil is fine. Don’t stress…it’s not bad for your heart! Stanton is correct that the anti-microbial effects of monolaurin (a breakdown product of lauric acid) cannot necessarily be translated to humans or that the body can make monolaurin from lauric acid in vivo (in the body) and while it’s always important to interpret any emerging evidence with a degree of caution, there is preliminary evidence for the use of coconut oil itself as an antimicrobial. Virgin coconut oil in its whole form doesn’t typically exert anti-bacterial actions and must be broken down to its monoglyceride or free fatty-acid forms to exert these effects.14, 15 Virgin coconut oil does not impede growth of Clostridium dificile but lipolyzed coconut oil does and lauric acid has greater antimicrobial effect than either capric (C:10) or caprylic (C:8) fatty acids.16 However, when used as a moisturizer coconut oil resulted in 19 of 20 people who had tested positive for Staphylococcus aureus colonies being retested as negative after 4 weeks. I’m not going to hang my hat on CO being an antimicrobial wonder drug BUT based on the evidence to date it does seem to exhibit some beneficial effects on impeding some pathogens and aiding wound healing. I don’t know and to be honest I don’t care. People get hung up too much on criticizing certain foods because it doesn’t fit their worldview. When in doubt go back to the research…and in this case, the weight of evidence shows us that coconut oil, while not being the cure-all that some claim, is a healthy addition to the diet and may offer some interesting functional benefits. 1. Assunção M, Ferreira H, dos Santos A, Cabral C, Jr., Florêncio TMT. Effects of Dietary Coconut Oil on the Biochemical and Anthropometric Profiles of Women Presenting Abdominal Obesity. Lipids. 2009;44(7):593-601. 2. Thomson ABR, Keelan M, Garg ML, Clandinin MT. Intestinal aspects of lipid absorption: in review. Canadian Journal of Physiology and Pharmacology. 1989;67(3):179-91. 3. Mu H, Hoy CE. Effects of different medium-chain fatty acids on intestinal absorption of structured triacylglycerols. Lipids. 2000;35(1):83-9. 4. McDonald GB, Saunders DR, Weidman M, Fisher L. Portal venous transport of long-chain fatty acids absorbed from rat intestine. American Journal of Physiology - Gastrointestinal and Liver Physiology. 1980;239(3):G141-G50. 5. Bloom B, Chaikoff IL, Reinhardt WO. Intestinal lymph as pathway for transport of absorbed fatty acids of different chain lengths. American Journal of Physiology--Legacy Content. 1951;166(2):451-5. 6. Prior IA, Davidson F, Salmond CE, Czochanska Z. Cholesterol, coconuts, and diet on Polynesian atolls: a natural experiment: the Pukapuka and Tokelau island studies. The American Journal of Clinical Nutrition. 1981;34(8):1552-61. 7. Kumar PD. The Role of Coconut and Coconut Oil in Coronary Heart Disease in Kerala, South India. Tropical Doctor. 1997;27(4):215-7. 8. Palazhy S, Kamath P, Rajesh PC, Vaidyanathan K, Nair SK, Vasudevan DM. Composition of Plasma and Atheromatous Plaque among Coronary Artery Disease Subjects Consuming Coconut Oil or Sunflower Oil as the Cooking Medium. Journal of the American College of Nutrition. 2012;31(6):392-6. 9. Sircar S, Kansra U. Choice of cooking oils--myths and realities. J Indian Med Assoc. 1998;96(10):304-7. 10. Feranil AB, Duazo PL, Kuzawa CW, Adair LS. Coconut oil is associated with a beneficial lipid profile in pre-menopausal women in the Philippines. Asia Pacific journal of clinical nutrition. 2011;20(2):190-5. 12. Khaw K-T, Sharp SJ, Finikarides L, Afzal I, Lentjes M, Luben R, et al. Randomised trial of coconut oil, olive oil or butter on blood lipids and other cardiovascular risk factors in healthy men and women. BMJ open. 2018;8(3). 13. Valente FX, Cândido FG, Lopes LL, Dias DM, Carvalho SDL, Pereira PF, et al. Effects of coconut oil consumption on energy metabolism, cardiometabolic risk markers, and appetitive responses in women with excess body fat. Eur J Nutr. 2018;57(4):1627-37. 14. Sia C, Yim H, Lai C. Commercial virgin coconut oil: assessment of antimicrobial potential. Asian Journal of Food and Agro-Industry. 2010;3(6):567-79. 15. Tangwatcharin P, Khopaibool P. Activity of virgin coconut oil, lauric acid or monolaurin in combination with lactic acid against Staphylococcus aureus. The Southeast Asian journal of tropical medicine and public health. 2012;43(4):969-85. 16. Shilling M, Matt L, Rubin E, Visitacion MP, Haller NA, Grey SF, et al. Antimicrobial Effects of Virgin Coconut Oil and Its Medium-Chain Fatty Acids on Clostridium difficile. Journal of medicinal food. 2013;16(12):1079-85. 17. Ogbolu DO, Oni AA, Daini OA, Oloko AP. In Vitro Antimicrobial Properties of Coconut Oil on Candida Species in Ibadan, Nigeria. Journal of medicinal food. 2007;10(2):384-7. 18. Peedikayil FC, Sreenivasan P, Narayanan A. Effect of coconut oil in plaque related gingivitis — A preliminary report. Nigerian Medical Journal : Journal of the Nigeria Medical Association. 2015;56(2):143-7. 19. Nevin KG, Rajamohan T. Effect of Topical Application of Virgin Coconut Oil on Skin Components and Antioxidant Status during Dermal Wound Healing in Young Rats. Skin Pharmacology and Physiology. 2010;23(6):290-7. 20. Intahphuak S, Khonsung P, Panthong A. Anti-inflammatory, analgesic, and antipyretic activities of virgin coconut oil. Pharmaceutical Biology. 2010;48(2):151-7. 21. Zakaria ZA, Rofiee MS, Somchit MN, Zuraini A, Sulaiman MR, Teh LK, et al. Hepatoprotective Activity of Dried- and Fermented-Processed Virgin Coconut Oil. Evidence-Based Complementary and Alternative Medicine. 2011;2011:8. 22. Strunk T, Pupala S, Hibbert J, Doherty D, Patole S. Topical Coconut Oil in Very Preterm Infants: An Open-Label Randomised Controlled Trial. Neonatology. 2018;113(2):146-51. In a recent Consumer Magazine article on protein supplements, several claims were made about products I co-developed as one of the founders and formulators for Nuzest. While I think on balance Consumer do an excellent job, in this case, the claims about Clean Lean Protein and Just Fruit and Veg were spurious. Is Clean Lean Protein high in salt? According to consumer magazine Clean Lean Protein is high in salt. It is disingenuous to suggest that this is a ‘high’ salt load. A serve of CLP is 25 g, which would provide 357 mg of sodium. To put this in context, mortality and morbidity are increased at both high and low levels of sodium intake. (1, 2) In other words, there is a ‘U-shaped curve’ of morbidity (disease) related to extremes of intake, whether high or low. The range within which no discernible health effects are seen lies between 2,645 and 4,945 mg (1) or as high as 6000mg. (2) So, CLP provides only 6-13% of the safe daily value of sodium. As protein powders are designed to be used as major components of meals, this is a trivial amount of sodium. Again, this is a trivial amount. In one serving of Just Fruit and Veg there is 3 g of fat, of which 2 g is saturated (a mere 18 calories). This amount is unlikely to cause any substantive effect in the body. Dose notwithstanding, we would question the caution against saturated fat. While substitution studies do show that replacement of some saturated fat with polyunsaturated fats improves CVD mortality outcomes, (7) they do not find that replacing saturated fat with monounsaturated fat or carbohydrate similarly improves outcomes. So, it should be concluded that polyunsaturated fats (i.e. essential fats) are important and not that saturated fats are bad. If saturated fat independently worsened outcomes, any reduction by replacement with nutrients deemed ‘heart healthy’ (carbohydrates and monounsaturated fats) should improve outcomes, which it doesn’t. In a meta-analysis of fatty acid substitution RCTs Mozaffarian et al., stated that we “cannot distinguish between potentially distinct benefits of increasing polyunsaturated fatty acids (PUFA) versus decreasing saturated fatty acids (SFA).”(8) Therefore, based on the weight of evidence, saturated fats in the context of an otherwise healthy diet don’t increase your risk of either cardiac disease, mortality, or all-cause mortality. Can you get all you need from diet? While of course food comes first, and you can get all you require from diet, the reality is that most people do not. US Department of Agriculture data shows that some fresh produce (vegetables, fruits berries) may only provide around half the amounts of some vitamins and minerals that they did in the 1950s. (9) So, while we have been eating more (and getting bigger!) over time, and taking in more than enough calories and ‘fuel’, we aren’t necessarily getting enough of the ‘little guys’, the vitamins, minerals and secondary nutrients that act as co-factors for energy creation, hormone and neurotransmitter creation and that help to reduce the oxidative damage resulting from both environmental and lifestyle stressors, and that we create as part of our normal process of energy created within the cell. · 8% of people fail to get enough B12. B12 is required for proper functioning of nerve cells and without adequate B12 people can suffer from a form of anaemia and ultimately lack of B12 can permanently damage neurons. · Nearly 10% of women don’t get enough iron. Iron deficiency results in anaemia, lethargy and loss of muscle strength and endurance. · Around 25% of people don’t consume enough zinc. Zinc is extremely important for immune function and for the creation of testosterone. Interestingly nearly 40% of males may not get adequate zinc from their diet, which could increase the risk of colds, flu and reduce the ability to build muscle. · 45% of people don’t get enough Selenium, a mineral lacking in New Zealand soils that is vital to thyroid function and metabolic rate. “While it’s true you need protein for building and repairing tissue and muscles, Ms Carey said you can get all you need from a balanced diet. Your daily protein requirement can be calculated as roughly 0.8 to 1g per kilo of body weight. So, if you’re 70kg, you need between 56 and 70g of protein. The latest New Zealand Adult Nutrition Survey found 98% of adults got their required daily protein intake, with some getting more than double what they needed. Many people, in contrast to the statements above, do not get enough protein to thrive. "Choosing whey-, egg- or soy-based protein powders is also better because they have good amino acid profiles and are quickly digested. Protein found in meat, fish, poultry and dairy products has all 20 of the amino acids our bodies need. Two plant foods, soy and quinoa, are also complete proteins. Other foods, such as peas, tofu and oats, also have protein, but not all of the amino acids. So, while you’ll still get protein from a pea-based powder, it’s not a complete option." Also worth considering, while dairy is fine for most people, it is also a common allergen, and there appears to be a rising incidence of milk protein intolerance and allergy. (29) Egg too can be a common allergen, and soy is high in phytic acid and other ‘anti-nutrients’ making it less favourable than pea protein isolate. 1. Graudal N, Jürgens G, Baslund B, Alderman MH. Compared With Usual Sodium Intake, Low- and Excessive-Sodium Diets Are Associated With Increased Mortality: A Meta-Analysis. American Journal of Hypertension. 2014. 2. Alderman MH, Cohen HW. Dietary Sodium Intake and Cardiovascular Mortality: Controversy Resolved? American Journal of Hypertension. 2012;25(7):727-34. 3. Skeaff CM, Miller J. Dietary fat and coronary heart disease: summary of evidence from prospective cohort and randomised controlled trials. Ann Nutr Metab. 2009;55(1-3):173-201. 4. Siri-Tarino PW, Sun Q, Hu FB, Krauss RM. Meta-analysis of prospective cohort studies evaluating the association of saturated fat with cardiovascular disease. The American journal of clinical nutrition. 2010;91(3):535-46. 5. Mente A, de Koning L, Shannon HS, Anand SS. A systematic review of the evidence supporting a causal link between dietary factors and coronary heart disease. Arch Intern Med. 2009;169(7):659-69. 6. Hooper L, Summerbell CD, Thompson R, Sills D, Roberts FG, Moore H, et al. Reduced or modified dietary fat for preventing cardiovascular disease. Cochrane Database Syst Rev. 2011(7):CD002137. 7. Jakobsen MU, O'Reilly EJ, Heitmann BL, Pereira MA, Balter K, Fraser GE, et al. Major types of dietary fat and risk of coronary heart disease: a pooled analysis of 11 cohort studies. Am J Clin Nutr. 2009;89(5):1425-32. 8. Mozaffarian D, Micha R, Wallace S. Effects on coronary heart disease of increasing polyunsaturated fat in place of saturated fat: a systematic review and meta-analysis of randomized controlled trials. PLoS Med. 2010;7(3):e1000252. 9. Davis DR, Epp MD, Riordan HD. Changes in USDA Food Composition Data for 43 Garden Crops, 1950 to 1999. Journal of the American College of Nutrition. 2004;23(6):669-82. 10. University of Otago and Ministry of Health. A Focus on Nutrition: Key findings of the 2008/09 New Zealand Adult Nutrition Survey. Wellington; 2011. 11. Huang H-Y, Caballero B, Chang S, Alberg AJ, Semba RD, Schneyer CR, et al. The Efficacy and Safety of Multivitamin and Mineral Supplement Use To Prevent Cancer and Chronic Disease in Adults: A Systematic Review for a National Institutes of Health State-of-the-Science Conference. Annals of Internal Medicine. 2006;145(5):372-85. 12. Alexander DD, Weed DL, Chang ET, Miller PE, Mohamed MA, Elkayam L. A Systematic Review of Multivitamin–Multimineral Use and Cardiovascular Disease and Cancer Incidence and Total Mortality. Journal of the American College of Nutrition. 2013;32(5):339-54. 13. Macpherson H, Rowsell R, Cox KHM, Scholey A, Pipingas A. Acute mood but not cognitive improvements following administration of a single multivitamin and mineral supplement in healthy women aged 50 and above: a randomised controlled trial. AGE. 2015;37(3):1-10. 14. Sarris J, Cox KHM, Camfield DA, Scholey A, Stough C, Fogg E, et al. Participant experiences from chronic administration of a multivitamin versus placebo on subjective health and wellbeing: a double-blind qualitative analysis of a randomised controlled trial. Nutrition Journal. 2012;11(1):1-10. 15. Harris E, Macpherson H, Vitetta L, Kirk J, Sali A, Pipingas A. Effects of a multivitamin, mineral and herbal supplement on cognition and blood biomarkers in older men: a randomised, placebo-controlled trial. Human Psychopharmacology: Clinical and Experimental. 2012;27(4):370-7. 16. Biesalski HK, Tinz J. Multivitamin/mineral supplements: rationale and safety – A systematic review. Nutrition. 17. Moshfegh A, Goldman J, Cleveland L. What we eat in America, NHANES 2001-2002: usual nutrient intakes from food compared to dietary reference intakes. US Department of Agriculture, Agricultural Research Service. 2005;9. 18. Fulgoni VL. Current protein intake in America: analysis of the National Health and Nutrition Examination Survey, 2003–2004. The American Journal of Clinical Nutrition. 2008;87(5):1554S-7S. 19. Cawood AL, Elia M, Stratton RJ. Systematic review and meta-analysis of the effects of high protein oral nutritional supplements. Ageing Research Reviews. 2012;11(2):278-96. 20. Kim JE, O’Connor LE, Sands LP, Slebodnik MB, Campbell WW. Effects of dietary protein intake on body composition changes after weight loss in older adults: a systematic review and meta-analysis. Nutrition reviews. 2016;74(3):210-24. 21. Kim JE, Sands L, Slebodnik M, O’Connor L, Campbell W. Effects of high-protein weight loss diets on fat-free mass changes in older adults: a systematic review (371.5). The FASEB Journal. 2014;28(1 Supplement). 22. Altorf – van der Kuil W, Engberink MF, Brink EJ, van Baak MA, Bakker SJL, Navis G, et al. Dietary Protein and Blood Pressure: A Systematic Review. PloS one. 2010;5(8):e12102. 23. Santesso N, Akl EA, Bianchi M, Mente A, Mustafa R, Heels-Ansdell D, et al. Effects of higher- versus lower-protein diets on health outcomes: a systematic review and meta-analysis. Eur J Clin Nutr. 2012;66(7):780-8. 24. Helms ER, Zinn C, Rowlands DS, Brown SR. A Systematic Review of Dietary Protein during Caloric Restriction in Resistance Trained Lean Athletes: A Case for Higher Intakes. International Journal of Sport Nutrition and Exercise Metabolism. 2014;24(2):127-38. 25. Pasiakos SM, Lieberman HR, McLellan TM. Effects of Protein Supplements on Muscle Damage, Soreness and Recovery of Muscle Function and Physical Performance: A Systematic Review. Sports Medicine. 2014;44(5):655-70. 26. Pasiakos SM, McLellan TM, Lieberman HR. The Effects of Protein Supplements on Muscle Mass, Strength, and Aerobic and Anaerobic Power in Healthy Adults: A Systematic Review. Sports Medicine. 2015;45(1):111-31. 27. Hansen K, Shriver T, Schoeller D. The effects of exercise on the storage and oxidation of dietary fat. Sports Med. 2005;35. 28. Babault N, Païzis C, Deley G, Guérin-Deremaux L, Saniez M-H, Lefranc-Millot C, et al. Pea proteins oral supplementation promotes muscle thickness gains during resistance training: a double-blind, randomized, Placebo-controlled clinical trial vs. Whey protein. Journal of the International Society of Sports Nutrition. 2015;12(1):3. 29. Rona RJ, Keil T, Summers C, Gislason D, Zuidmeer L, Sodergren E, et al. The prevalence of food allergy: A meta-analysis. Journal of Allergy and Clinical Immunology. 2007;120(3):638-46.